Like Control Scope and Control Schedule for the PMP Certification Exam, the inputs consist of the project management plan, work performance data, and OPAs. In addition, the project funding requirements are also an input. The outputs will deal directly with work performance information. Project management plan: There are two components you will use in this process. Cost baseline: Use this to compare planned expenditures against actual costs. Cost management plan: The cost management plan should identify the acceptable variances for cost performance. For example, if you are over budget by 20% on a deliverable but under budget on the project overall, should you report the variance? Under what circumstances can you use reserve, and what process do you use to update the plan to show that? How do you measure cost performance for in progress work? Work performance data: This includes which activities have started and finished, which costs have been authorized, and which have been incurred. Project funding requirements: The periodic required funds for expenditures and reserves. Organizational process assets (OPAs): Organizational policies, templates, and procedures you need to manage and report project costs. One of the methods you use to determine how well you’re performing is to look at the work performance data to determine how much work has been completed on work in progress. A common way of doing this is to ask the appropriate team member what the percent complete is. However, there are two problems with this approach: The first is that it’s subjective and can be abused; and the second is that for short-term activities, it’s time consuming. One way to reduce the time associated with recording progress is to set up a fixed formula for short-term activities, short-term being defined as spanning one to two reporting periods. You select a ratio that adds up to 100%, such as 50/50, 25/75, or 20/80. When an activity starts, the first percentage is credited. When the activity is done, the remainder is credited. Using a 50/50 measure is the most aggressive, and 20/80 is the most conservative. Although percentage isn’t a true measure of accomplishment — after all, it’s only short-term — the overall performance equalizes quickly because of the short-term nature of the measurement method. Some measurement methods are 0/100, meaning that no credit is allocated until the work is complete. However, using this method is appropriate only for small activities that span just one reporting period. The outcome of this process is the actual work performance information, such as the cumulative cost and schedule variances and the cumulative cost and schedule performance indexes. You will also have forecasts and the associated data to explain the assumptions you made for those forecasts. Cost management plan: If there are significant cost variances, you may need to revisit estimating techniques as well as levels of accuracy needed for estimating and reporting. Cost baseline: If changes have occurred or risk events have materialized, the baseline may be updated (but only after going through the formal change control process). Cost estimates: Cost estimates may be updated to reflect the most current information. Basis of estimates: As cost estimates are adjusted, the underlying basis of the estimates are also updated. Causes of variances: Make sure to also catalog the corrective actions taken to address the variances. Lessons learned: Record information that can be used later in the project and by other projects. 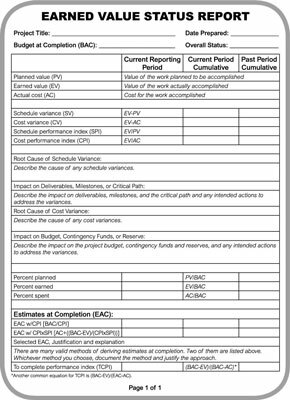 Here is an example of an EV status report that shows the common earned value measurements, the root cause of variances, and the impact on key objectives. Work performance information for the Control Cost process can be easily abused to hide cost variances. For example, if a project team lead takes delivery of a purchased item but the invoice has not yet been paid, the project could show the earned value of that purchase but not the incurred cost. If you take the credit for the EV without estimating the AC in your status report, you are not showing the true cost status. To avoid this type of behavior, you need to have clear reporting expectations in your cost management plan. We do not engage in or condone behavior that is designed to deceive others, including but not limited to, making misleading or false statements, stating half-truths, providing information out of context, or withholding information that, if known, would render our statements as misleading or incomplete.